Okay, nothing much happening in either area at the moment but, believe me, it’s all happening underneath – I hope! Even the tulips are that tiny bit bigger – could it be a very early spring, LOL? Finally, a harvest of sprouts for this week, though we haven’t kept the leaves as they were pretty well chewed. Sprouts have been delicious for Sunday lunch though, and there are some left over for tomorrow too. Categories: Allotments | Tags: asparagus, blackcurrants, daffodils, leeks, mulch, rhubarb, sprouts, tulips | Permalink. Our first snowfall came today – which for me was horrific as I utterly HATE snow. It’s the work of the devil, don’t you know. LOL! Anyway, thankfully for us in the south-east of the UK it hasn’t lasted long – or not hereabouts anyway, so K and I still visited the allotment just to see how it was doing. I wasn’t expecting to be able to do any hoeing as I thought the soil would be too hard, but in actual fact it was all fairly soft, so we managed a fair weed round – not that there was that many weeds anyway. K also brought down two bags of compost from home – but we’ll wait until the snow has gone until we actually mulch anything. There was a slight problem with our little trolley – which isn’t that great as it is – as one of the wheels came off, but luckily it was after he’d deposited the compost, so hopefully it’s mendable. Have a great week, everyone, and happy gardening! Categories: Allotments, Uncategorized | Tags: compost, hoeing, snow, sprouts | Permalink. Well, I’ve been a poor blogger. In short …….I took a bit of a step back in 2015 and only made Wordless Wednesday posts. I felt I needed to reassess what I was trying to achieve with this blog, and what I really wanted to say. I’ve also been extremely busy most weekends over the year with an huge amount of DIY and decorating done to the house, in short the non-gardener and I have lived here years and not touched the decorating once… And believe me, it needed touching! In order to keep costs down, I’ve done most of the prep work and junk disposal before tradesmen moved in and got started. 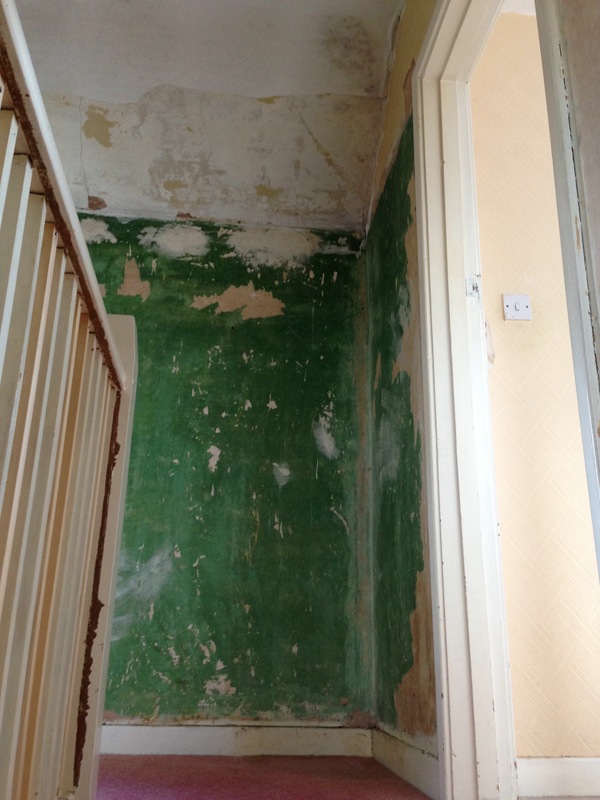 The horror under the wallpaper…. Great news today! I have started driving again after my operation in December and everything was fine. It was ridiculous how nervous I felt before I got in the car – but though it felt weird, there wasn’t any pain and I managed to drive to the village and also to the allotment, hurrah! And there’s even more excitement – the daffodils sharing their bed with the leeks are well on the way, and also the tulips are just beginning to show themselves, well gosh. Categories: Allotments, Uncategorized | Tags: beetroot, blackcurrants, daffodils, leeks, slugs, spinach, sprouts, tulips, weeding | Permalink. It’s January, and for me that means something very important! It’s time to winter sow some annuals (and perennials!). The discovery of winter sowing was a complete game-changer for me. You see, my tiny little house is a dark wasteland, and the last thing that thrives here are delicate seedlings. Moving the operation outdoors is definitely the answer for me.